Some of my fondest memories growing up include family dinners. Dinner happened after activities and right when my Dad came home from work, which was usually around 6:30pm or 7pm. Naturally, when Joey was born and started on his solid food journey, I had the best intentions to serve family style meals every night. Joey could choose what he wanted [ideally everything on the table] and Mom and Dad could pass the plates and enjoy a meal too. But guess what? Joey started choosing extra chips on nachos night. Joey wanted ALL THE WATERMELON vs. grilled BBQ chicken and green beans. And then along came Anthony and Lily and dinnertime started feeling more like a wrestling match than the time of day when we came together as a family. So I switched my family meals mindset and started plating meals BEFORE we sat down at the table, deconstructing the entire meal based on everyone’s wants and likes [Mom’s included- you better believe I’m serving up NEW things with old favorites], and alas: the deconstructed family dinner was born. Deconstructed Meal #1: Grilled chicken hummus bowls with brown rice and greens for Mom and Dad, and the same chicken + hummus for the kids, along with a side of cucumbers and brown rice. Not everyone loves what I make for dinner. I’ve accepted that. But dinner being my favorite meal of the day and the one meal I enjoy cooking the most, I’m willing to compromise when it comes to what gets plated on my kids’ plates. I’m still making the decisions on what’s being served and how much is being plated [hello reducing food waste! ], then my kids then decide how much they’ll eat. This ensures they a. will always have something nutritious on their plates and b. they’ve come to know Mom won’t make some crazy mealtime decision that sets everyone off into a 5pm dinner tizzy. Deconstructed Meal #2: Mom and Dad had chicken sausage + peppers + marinara with a side of cauliflower rice. The kids had the same rice, sausage + peppers on the side, and the same marinara over penne. Plating deconstructed meals for my toddlers has actually opened their horizons to tasting and trying new foods because in simple terms: I’m not really giving them a choice. However, if they decide they do not want a bite of the taco meat and would rather have a second helping of chips and guacamole, I go with it. I believe and have found half the battle in getting kids or toddlers specifically to try new foods is to keep exposing. So, the more I share or plate it, the most I’m hoping the smells, sights, and finally taste, will entice them. Deconstructed Meal #3: Veggie-topped hot dogs with a side of baked sweet potato fries for Mom and Dad, and hot dogs with extra fruit and veggies for the kids. From afar, deconstructing meals for the entire family might seem like short-order cooking. But the reality is I never deconstruct a meal for Ted and myself. And one of my three will usually ALWAYS like what I’m serving. The other two? Well, then that means I’m picking out pieces or favorites, and maybe adding something else to their plate that I’ve prepped a different day. Or heck, they are getting an all-beef hot dog or chicken nuggets. Not every night, but I’ll admit that happens! Case and point of a non-deconstructed meal. Mom wanted ALL.THE.VEG. in a big healthy chicken salad, and the kids had some random sides [rice and corn] with the same chicken Mom had along with hummus for dipping. Whatever works! What to know the BIGGEST reason I’m loving deconstructed family dinners right now? They give me a higher percentage of actually eating a hot meal WITH my family and it often leads to more time for mealtime conversation that doesn’t revolve around complaints or demands. If something I do for my family puts ME FIRST, well then, I should keep doing it, right? It works for now. And just like serving family style meals worked when it was just Mom, Dad, and Joey, I’m assuming things will change when I have school-age kids and teens, and hopefully we can bring back the task of everyone plating their own meal. For now deconstructed meals work, and I’m not messing with a good thing! Deconstructed Meal #4: A popular one-> Mexican night! Which means Mom and Dad get everything in a bowl, Joey eats all the cheese quesadillas he can, Anthony and Lily gobble down guac and corn and chips, and everyone eats in peace. I hope I’m not jinxing myself! What do your family meals look like? Plating meals or serving family style? Katie, I’m new here on your blog and absolutely love all your posts! 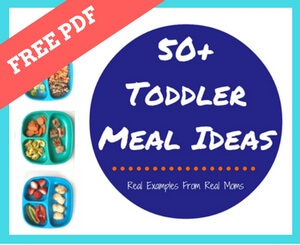 I came across your site after searching relentlessly for toddler meal ideas. Before I found your blog I was having difficulty feeding my 20 month old nutritious meals all while taking care of my 10 week old! After I got looking I saw that you have four beautiful kids and you still put delicious meals on the table at the end of the day. You are such an insipiration to me and you are super mum!!! I will continue to read and get inspiration from your site because it’s the only one I’ve come across that I actually like to read and like what I see! Hello, deconstructive meals!